As a contractor we look to make sure the client is getting the kitchen they need. There are a few questions you have to ask yourself before you start to remodel the area. How much do I really use the kitchen? Do I have the budget to get the ideal kitchen I want and how long will the kitchen remodeling take? Budget and kitchen use I would say are the most important questions here because if you are constantly using the kitchen and if you enjoy cooking you are going to want to have this planned perfectly. If you are someone who eats out more and uses the kitchen now and again to heat things up and cook the odd meal then the focus will be different for you on how you want the set up to look. If you would consider yourself to fall in to this bracket then we not only have to look at the layout and the style of kitchen you want but appliances. Something to think about is do you want to put more money in to buying a nice big gas stove and oven plus a big fridge? Also you might want a bigger sink and high end dishwasher. This could affect your kitchen remodeling budget so you might have to scale back on installing a backsplash or possibly just tile up behind the stove and paint the rest of the walls between the cabinets and counter tops. Also you will need to look at counter tops, with material like quartz and granite and wood there are different options that differ a great deal in price. You can go from 10 dollars a sq ft for some wooden counter tops all the way up to 100 dollars a sq ft for granite and stone counter top depending on the quality you want. Our goal is to make sure you get the dream kitchen you want for the budget you have in mind. We will help you design and choose products that will suit your needs and we have deals with all the wholesale distributors in the area so we can guarantee the best prices for you. Sometimes people have these grand kitchens built and they don’t use them that much. So if you are more of a person that eats out a great deal and you are not really home that much your kitchen will need to be good looking in design but you can save on appliances. Why has a huge fridge when you never stock it? You don’t need a big expensive gas stove if you don’t use it much. You can get away with a small dishwasher instead of a more expensive bigger one. You will be suppressed with just how much you will save in appliances alone. You can also compromise on counter tops with those savings from appliances. Instead of going for a high end stone around $100 you can get hard wearing quartz for half the price that looks modern and gives that wow factor. You can also look at getting a nice backsplash installed that will be easy to wipe clean and add that instant sleek factor. 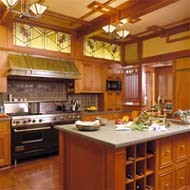 We like to make sure with every kitchen remodeling budget that the client is getting the most value. For more additional kitchen remodeling tips we can help you out, just contact us and one of our licensed contractors will come out to your home and advise you on the best kitchen solution to suit your cooking needs. We're a One-Stop shop for all your Kitchen Design & Renovation needs! Find Kitchen Contractors Near You.